Kahani 2: The Actors Save it! In India, so far certain weird sides of human nature were kept under the carpet and pretention of ignorance had been in vogue. This denial is, in fact, a crime; but, these were ignored even though in some cases it led to a trauma as the individual grew. But, today film makers become bold and prefer to educate the public on certain grey sides of human behavior. Sujoy Ghosh’s intention to highlight the impact of female child abuse is laudable. What surprise the viewer is the narration and the building up of climax like that of a messy potboiler. Further, the whole episodes in the film seem to take place in either nights or dimly lighted interiors of the house or decrepit police station. Vidya Sinha, a single parent plans to take her girl who cannot walk to USA for treatment. She leads a humble life but with a dark past. But, suddenly on a busy working day she returns from the office to only find an empty home; her daughter is kidnapped by someone who demands her personal appearance. On her frantic chase, she meets with a road accident and hospitalized. A newly transferred police officer shocks to see her. Additionally, she is found to be Divya Rani Singh who is a killer and kidnapper of a girl child. There are lots of knots which have to be untied before the climax and there only is the twist to the tale. The story of mystery and misery unfolds in uneven tempo. The locations are dilapidated homes, dark alleys, shady interiors and homes and on the whole, the eyes get strained on continuous watching. Vidya Balan had acquitted her character with true understanding. A crusader for justice to a victimized girl child, her emotions and anger, frenzy, desperation and angst were palpable. Arjun Rampal as the male lead Inderjit , the police officer who gets the true picture of the case and makes his best efforts in his own way is impressive. There are supporting actors like Naisha Khanna, Jugal Hansraj and Amba Sanyal. As I have mentioned in my earlier review that films which are women centric, of late, are spared by the critics irrespective of the quality of the output. 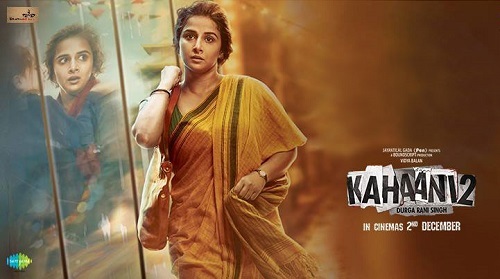 ‘Kahani 2’ is no match to ‘Kahani’. A better illumination literally and figuratively would have made the movie a worthy watch.